i Click 'view all' to instantly compare this ok deal with offers on other top colored pencils. Thornton's Art Supply Premium Colored Pencils 150pc & Pencil Case is currently selling at $64.99, which is its normal price. It has a lowest price of $64.99 and is selling within its usual range. Price volatility is 0.15% (meaning it does not change often), so you might have to wait a while for the price to drop. Until then this is a recommended 'ok deal'. There is a coupon available for an additional 10% off. The current deal is also the best price on this item over the last month. 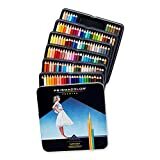 Compare the current price, savings (in dollars & percent) and Buy Ratings for the top Colored Pencils that are closely related to Thornton's Art Supply Premium Colored Pencils 150pc & Pencil Case. Here is how Thornton's Art Supply Premium Colored Pencils 150pc & Pencil Case compares with other leading Colored Pencils. 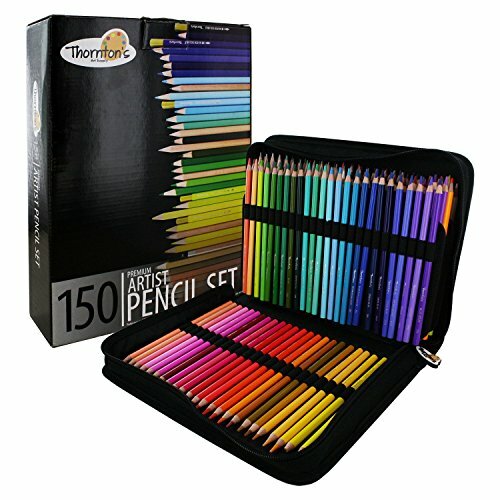 Introducing Thornton's Art Supply 150 Piece Premium Artist Colored Pencil Set for Drawing and Sketching. From casual coloring in the classroom or adult coloring books to the budding artist or the gallery veteran, these are the perfect colored pencils to fit your artistic needs. 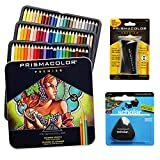 This Premium Artist set boasts a variety of colors including soft core pencils, water soluble pencils, metallic, neons, sketch, and charcoal pencils. Combined, you can create masterpieces with a full spectrum of vibrancy, shadows, and highlights. They also blend smoothly into one another, creating fabulous color transitions and combinations together. Thornton's Art Supply Premium Colored Pencils are designed to not scratch or smear on your paper, so every mark is deliberate and defined. Invest in the colored pencils that will enhance the beauty and imagination of your creation. This set also comes in a professional black canvas carrying case with each colored pencil tip pre-sharpened. It is intended to protect each pencil from end to end while keeping them all conveniently organized, great for both transportation and storage. This collection includes almost every color within the color wheel, and with the ability to adjust the shade in your stroke, giving you every hue that you'll ever need. With a simple adjustment in your pressure you can turn sheer to opaque, and then back to sheer. Each pencil is also designed with incredible durability so that under normal weight your point will not snap. Premium premier colors metallic neon neutral rainbow artist classroom carrying case drawing sketching coloring adult book point tip charcoal soft core hard water soluble pigment sheer opaque sharpened pressure no smear scratch beautiful vibrant variety bold rainbow protection storage arts and crafts blending professional beginner rich performance high quality heavy duty durable reliable sturdy set. FeaturesEXTENSIVE COLOR RANGE AND BLENDING OPTIONS: This Premium Artist set boasts a variety of colors including soft core pencils, water soluble pencils, metallic, neons, sketch, and charcoal pencils. Combined, you can create masterpieces with a full spectrum of vibrancy, shadows, and highlights. They also blend smoothly into one another, creating fabulous color transitions and combinations together.SMOOTH LINES WITH NO SCRATCHING OR SMEARING: From adult coloring books to the art gallery, you deserve high quality products that will not mar your piece. Thornton's Art Supply Premium Colored Pencils are designed to not scratch or smear on your paper, so every mark is deliberate and defined. Invest in the colored pencils that will enhance the beauty and imagination of your creation.READY TO GO AND ON THE GO: The Thornton's Art Supply 150 Piece Premium Artist Colored Pencil Set comes in a professional black canvas carrying case with each colored pencil tip pre-sharpened. It is designed to protect each one from end to end while keeping them all conveniently organized. It is ideal for both transportation and storage for the traveling artist who appreciates efficiency and organization.PRECISE CONTROL OF EACH SHADE: This collection comes with almost every color within the color wheel, and with the ability to adjust the shade in your stroke, giving you every hue that you'll ever need. With a simple adjustment in your pressure you can turn sheer to opaque. Each pencil is also designed with incredible durability so that under normal weight your point will not snap.